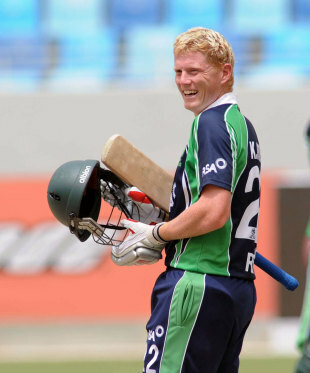 Kevin O'Brien, the Ireland allrounder, has said the upcoming ODIs against Pakistan are a welcome chance for his team to match skills with a Full Member side. Ireland, who last played a top team during the 2012 World T20, are set to play Pakistan in two one-dayers in Dublin on May 23 and 26. "It'll be a great chance for me personally and for the team to show what we can do again," O'Brien told Pakpassion.net. "It has been a while since we've played a Full Member." Following their famous victory against Pakistan in the 2007 World Cup, Ireland lost their next two encounters when Pakistan visited the country in 2011. O'Brien said the he would not be overawed by having to face Saeed Ajmal, the No. 1 ranked ODI bowler. "We played against him two years ago and we know that he's obviously a tricky customer," he said. "[But] there are no specific plans for him, just go out and enjoy facing a great spinner. We'll have to give him the respect he deserves and try to score off as many balls as we can." The question of giving Ireland Test status is one that has been floating around for a while. According to O'Brien, the team still has some way to go before they can make the step up. "We're still a few years away from being a Test team. Bangladesh, when they were given full status, were probably dominating Associated cricket for 10 to 12 years. We've only been doing it for six or seven years," he said. "We don't have as big a pool of players as Bangladesh either. "Cricket Ireland needs to put a few things in place in terms of first-class cricket and multi-day cricket in Ireland, and I think they're certainly going towards that. In the future, possibly in three of four more years, Ireland could be playing a Test match against Bangladesh." He empathised with scheduling issues facing the Full Member countries when it comes to accommodating Associates. "Bigger teams need to concentrate on Test series and one-day series that are already in place, and to add an extra two or three games on the tour to play us is really difficult. England have come over two or three times in the last couple of years and Pakistan had also come here in 2011. We're getting more and more opportunities. "We'd obviously like more but we can't be too greedy. We just have to bide our time and when we do get a chance, perform well and get a few victories." O'Brien was also pleased about "definite" progress made by Associate nations over the last five or six years. "Afghanistan are a good side, as are Holland who are improving all the time. Then you have the likes of Scotland who are getting better and better with their young team. It's definitely getting more and more competitive at the Associate level and it's great to see." The two one-day internationals will be streamed live on YouTube - via the Cricket Ireland channel - after the board struck a deal with Google and Quipu TV to broadcast the game online. The matches were not going to be shown on television. However, the deal is unlikely to help fans in Pakistan were YouTube is banned.